Concrete planters on the south and east sides of this hillside house were the cleanest solution for softening and screening the big-box look of this large home in the North Admiral neighborhood. Levels of planters filled with hardy, natural northwest plants blur the hard edges of the building, while contrasting colors of burgundy, chartreuse and dark green repeat throughout the garden. Four stately hornbeams, traditional hedge trees in England, mask the house and provide privacy for the entry. Beneath the alpine firs, a basalt column provides a protected bathing area for the birds. 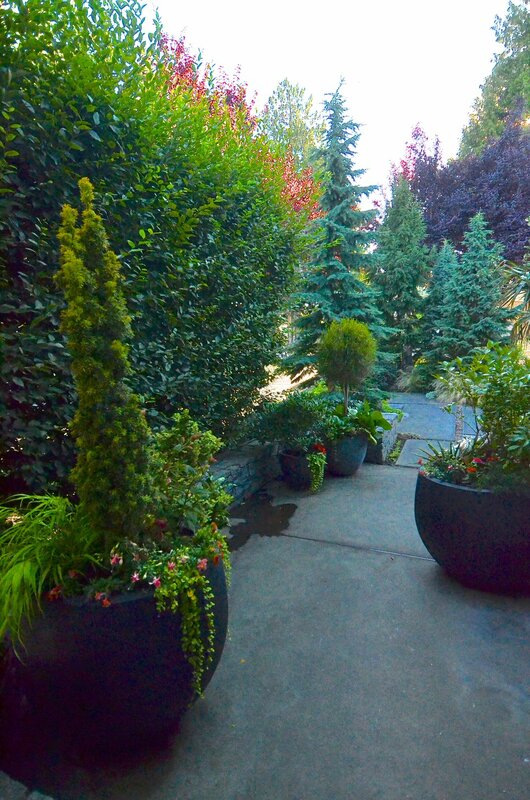 Near the entry to the house, oversized pots filled with seasonal color encourage wandering. The sculpture by Steve Jensen is the perfect visual, both from close up at the entry and from the sidewalk, where it is framed by hornbeam and katsura trees. Evergreen groundcover, Rubus calycinoides or creeping raspberry, cloaks the entire parking strip on the south side of the house. It is both drought-tolerant and forgiving of light foot traffic. Along the sidewalk, the chartreuse of the Japanese forest grass contrasts dramatically with the burgundy of the maples and barberries. Miniature rhododendrons and hebes enliven the walk. Stacked stone is used as textural interest to define both entries. Visitors are invited to climb the back-entry stairs where Italian cypress soar, 40-year old Hinoki cypress thrive, a 20-year old palm basks, and fragrant jasmine and mock orange bloom near the windows. This home provides the perfect example of how a large dwelling on a single city lot can be enveloped in a luxurious garden, full of color, texture and fragrance. Most of the garden is wheelchair accessible from the sidewalk, although the sidewalk is steep.